There is a need for an efficient platform for political discussions, where all parts of the discussion can be fact checked. Confirmation bias and filter bubbles are becoming a danger to society, which means we need new ways to challenge our own opinions and prejudices. 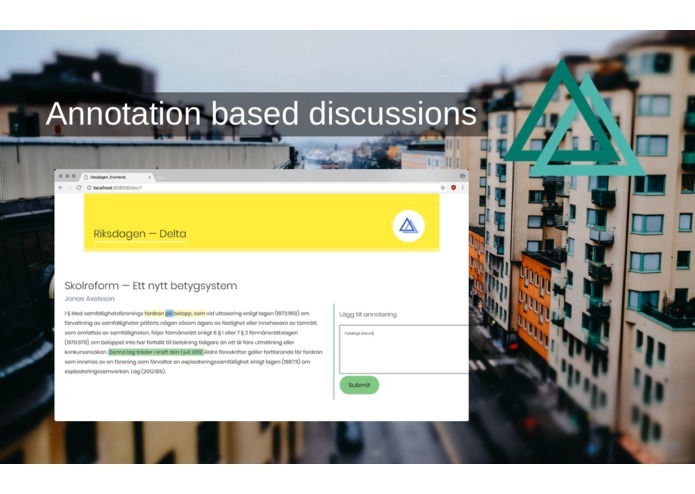 To solve this problem we introduce an annotation based discussion platform. 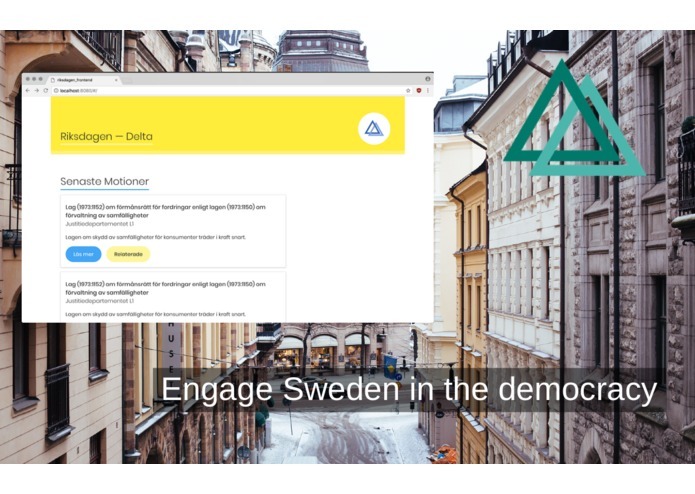 Citizen can comment, ask questions, dispute motions and transcripts directly from the parliament. This gives more context than a regular comment field, and makes it easier for people to understand difficult documents. In order to remain a coherent society where all views and opinions are allowed to coexist and be out in the open, we need to have a joint discussion platform where important discussions aren’t lost in the masses of online activity. We used motion and debates data from http://data.riksdagen.se/. These were rendered in a clean website built with Vue.js. On the backend we use Flask to store the information, where we also use NLP to summarize long and difficult to understand texts. The biggest challenge we had was how to design a commenting system that is designed to invite constructive discussion. Our main solution was to use a more constructive system than the usual like/dislike button, we have a “delta” button that symbolize that someone changed your view. We combined different ideas and came up with a solution to a problem we found important. We got to a presentable demo in less than 48 hours. We had to think about how to structure discussion and moderation which are important part to crowd sourced platforms in general. Our next step is to build a fair and working moderation system to keep the debate productive. We also want to implement more advanced summerasation and present useful statistics for the user reading the documents. Worked on backend and database stuff with peewee.